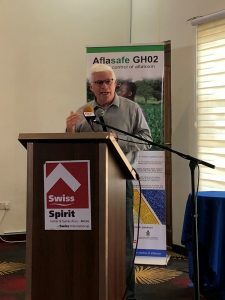 On June 29, 2018, A4NH researchers with the International Institute of Tropical Agriculture (IITA) were joined by government officials, members of the private sector, and others to formally launch Aflasafe GH02TM, a Ghana-specific version of the all-natural product developed by IITA to fight aflatoxins in crops throughout Africa. A4NH Director John McDermott attended the launch and addressed the gathering, noting that while aflatoxins have important health impacts, the greatest current impacts are economic, threatening access to higher-value local and export markets. "This is an important issue, and one where practical solutions are needed," he remarked. With the launch, Aflasafe GH02 will be available to farmers in Ghana, imported from IITA headquarters in Ibadan, Nigeria, where it is currently produced. A next step, researchers say, will be identifying private-sector partners in Ghana to start manufacturing and distribution in country. IITA is working to expand Aflasafe throughout Africa: in 2017, an estimated 100,000 hectares of maize and groundnut crops in four countries were protected from alfatoxins by Aflasafe. Earlier in the year, IITA signed a transfer license with BAMTAARE SA, to begin production of Aflasafe SN01TM in Senegal for use in Senegal and Gambia, marking the first license to be granted to a private company in Africa. In Nigeria, the Aflasafe AgResults pilot project recently held its fifth training and induction session in its efforts to engage private-sector experts to facilitate access to Aflasafe for smallholder farmers. In the project's first four years, nearly 600 tons of Aflasafe have been sold, and 33 private-sector experts have engaged with approximately 50,000 farmers in 13 states. In late 2016, construction on a plant in Kenya to produce Aflasafe KE01TM was completed, enabling the Kenya-specific strain of Aflasafe to be grown and distributed locally. To learn more about the launch of Aflasafe in Ghana and developments with the product elsewhere, please visit www.aflasafe.com.